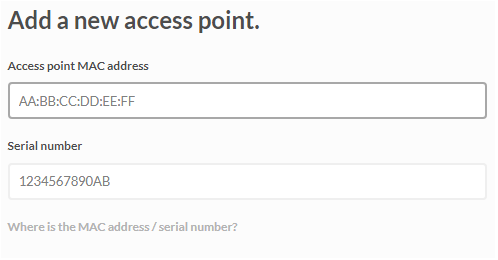 The Access Points page has a main page and a settings page. 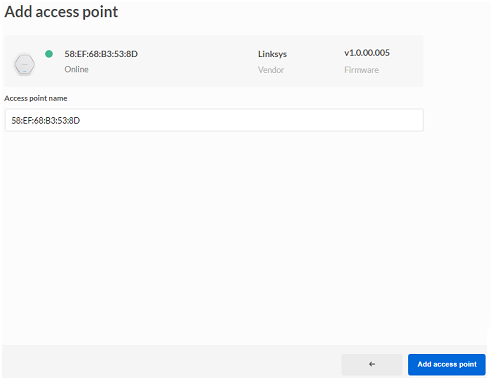 The main page displays a list of all your Linksys Business Cloud Access Points in the network. 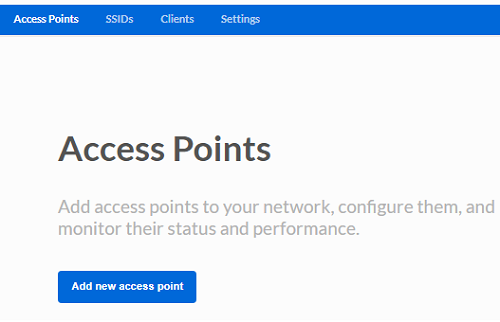 The settings page allow you to configure and monitor a specific access point's status or performance. For instructions on how to do this, click here. 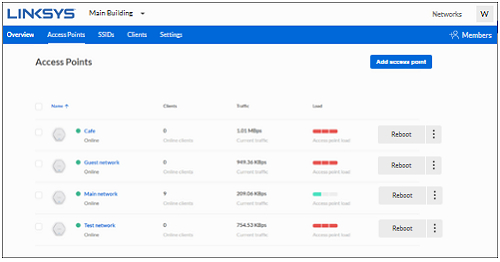 IMPORTANT: Before making any changes, make sure you are in the correct network by checking the top-left section of the page to prevent from configuring access points in other locations. Follow these steps to add an access point. On the Networks page, select a network then click the Access Points tab. Click Add new access point. 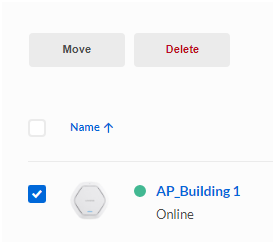 NOTE: If you have previously added an access point, you will see the Add access point button instead. Click New access point. Enter the MAC address and serial number of the access point and then click Next. Click Add access point. You can add an unlimited number of access points to a network. NOTE: You also have the option of adding an access point from Inventory. The first column displays all the access points in a network. 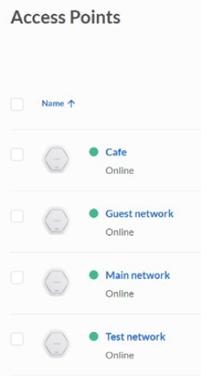 Sorting the access points - You can sort the access points by their names, status or when they were added to the network. Online/Offline status - Green dots indicate online access points and any red dots indicate offline access points. Move – moves the selected access point to Inventory. All data and settings in the device will be lost. To do this step, click the checkbox > Move > Confirm. Delete – deletes the selected access point from the network. This needs to be done if you are replacing or returning the access point (i.e.,RMA) or if you will no longer use the access point. To do this, click the checkbox > Delete > Delete. The Clients column displays the number of clients connected to the access point. The Traffic column displays the current traffic per access point. This displays the access point load. You can click on an access point to check the load. Click Reboot > Reboot to restart the access point. 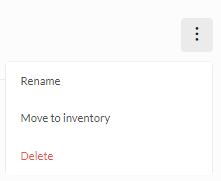 Click the ellipsis icon of an access point to display the Rename, Move to inventory, and Delete options. Click Rename to enter a new name for the access point. Click Confirm to save your changes. Click Move to inventory > Move to move an access point to Inventory. Click Delete > Delete to permanently delete an access point from the Cloud.